Over the last months, I tried to repair my broken x61s which suffered from a missing backlight. Anyway, changing the inverter didn’t bring my backlight back up. So I got myself a LCD cable which is more expensive and a bit harder to attach than the inverter. You need to remove the LCD panel from its case which involves a lot of screws. Don’t miss to have separate bowls for the screws and even better: take pictures or notes to remember where the screws have been. Or be very disciplinary to follow the official instructions. However, changing the LCD cable didn’t bring any remedy. So the only culprit, that I could think of, was the CCFL that’s actually responsible for lighting up the whole thing. So I got myself a new CCFL for a couple of euros. Changing the CCFL is a bit messy, especially because it involves soldering. There are good instructions on the web as to how to change the CCFL. It also requires you to be very kind with the the tube so that it doesn’t break. And losing any part will probably result in a substantial loss of quality for you, so be careful. I mean it. I lost a tiny rubber ring which is to be placed around the tube to hold it tight in its channel and now the tube vibrates nicely in the panel making interesting noises. would have saved us a lot of trouble. So after having cross checked that my inverter was working correctly and the backlight was acting weird, I came across the fact that there might be a blown fuse. And well, the F2 fuse, which was not findable without the helping picture, was not letting anything through. Since it’s a SMD fuse there was no chance of soldering a new fuse onto the mainboard. So we just shortened the fuse with conducting silver paint. Ja Mensch, herzlichen Glückwunsch, dass du das wieder hinbekommen hast! War ja nun echt schon ne Weile. 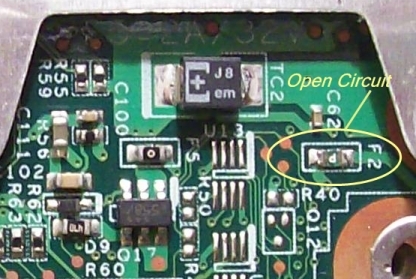 I’m going to replace the broken lcd screen on my acer aspire 5732z, how can i tell if i need a LED or CCFL? i’ve opened the screen case and looked behind the screen but i still can’t tell. Realy good post, very useful information.